The Johns Hopkins Carey Business School supports business knowledge development and education through our own initiatives, innovations, and collaborative programs across the Johns Hopkins University. We create and share knowledge that shapes business practices while educating business leaders who will grow economies and societies, and are exemplary citizens. Build a business school for Johns Hopkins that is recognized around the world for its faculty research and its development of business leaders. The values of the Carey Business School are guiding principles that help us achieve the mandate and mission of the school. As faculty, staff, and students, we strive to practice these values in our work, our research, and our studies, as we teach business with humanity in mind. We define our values as the following: collaboration, integrity, respect, community, leadership, and entrepreneurial. 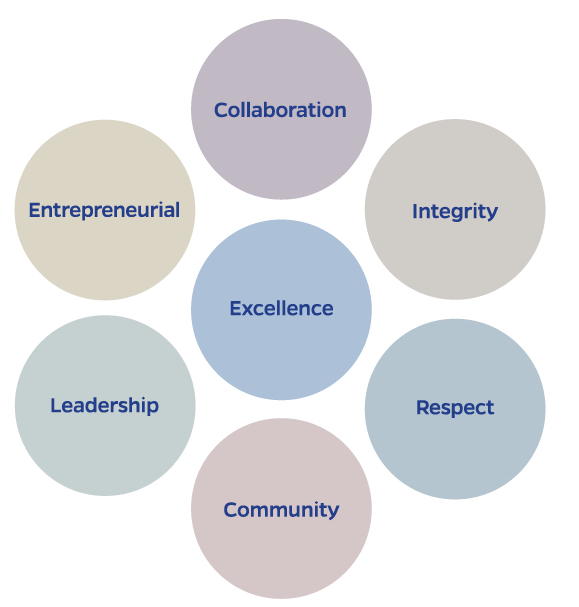 Our values form a CIRCLE, with “excellence” at the center. Excellence has been a cornerstone of Johns Hopkins since its founding, and the Carey community must operate at the highest levels in all of our functions.